EA CEO John Riccitiello questions whether Treyarch has the ability to make a Call of Duty game on par with Infinity Ward. Call of Duty creator Infinity Ward was shaken up by a massive employee departure when co-founders Jason West and Vince Zampella were ousted from Activision. Treyarch stepped up to the plate for Activision by following up on Infinity Ward's Modern Warfare 2 with Call of Duty: Black Ops, which sold magnificently, but according to EA CEO John Riccitiello Treyarch still isn't a studio on par with the original Infinity Ward just yet. In an interview with IndustryGamers, Riccitiello noted that sales numbers don't necessarily indicate quality. Black Ops may have beaten out Modern Warfare 2 at retail, but its average review scores are slightly lower. Because of this, he feels it's a little too early to call Treyarch an Infinity Ward replacement. "I don't know that having two guys that probably don't play the games, in the form of the CEO of Vivendi and the CEO of Activision, come out and say 'Treyarch is our lead developer,' like you could anoint that," Riccitiello said. "They didn't make a 90-rated game; I think it's 86 now. I don't think review scores are the be-all, end-all, but we all know a mid-90 when we see it, but this was mid-80s. I don't think you could anoint them by an executive saying, 'it's so.'" "The question, I think, really is, 'what developer is going to put forward the next great FPS that sort of follows [what Infinity Ward did],'" he continued. "It's wishful thinking, and let's hope for Activision's sake they're right. I think it's far from proven that the gaming consumer views a product from Treyarch in the same category as a product from what was Infinity Ward." Of course, Riccitiello thinks that EA has the goods to release a game on par with the products that Infinity Ward put out in the past, once it works out some kinks. 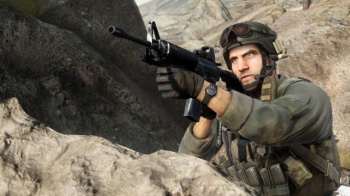 EA's Medal of Honor reboot scored lower with reviewers than Black Ops on average, but Riccitiello still views the game, and other EA properties, as successful efforts in the shooter war. "Next year we'll make a lot more progress," Riccitello believes. "We've got a couple of third-party games in the form of Crysis 2 and Bulletstorm, and then our big focus is Battlefield 3 in the second half of the year. I'd be shocked if we didn't take a notch out of [Activision]." Riccitiello also criticized Activision for taking as long as it did to sell so many copies of Call of Duty. "Activision will do 25 million on the tail of last year's Modern Warfare 2 and the start of this year's Black Ops, and then probably something similar next year," he said. "But it took them, what, five or six editions to get into double digit millions?" Riccitiello has been pretty vocal about EA's potential to take on the massive Call of Duty franchise, so all that's left is for the company to back up his talk.